We have so many friends from Build-A-Bear Workshop® and this holiday season they have the most adorable gifts for your littles. 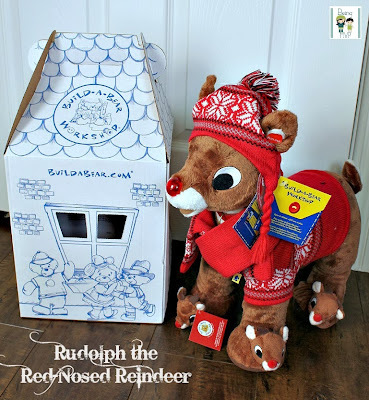 We received Rudolph the Red-Nosed Reindeer for review and he was all decked out in his winter gear. This is the perfect Build-A-Bear gift for Kenzie who is a Christmas morning baby. She is finally aware of Santa and all the gifts that he brings while riding his sleigh manned by his reindeer. The reason for this late awareness is because we tried so hard to make her birthday stand out and be special each year that Christmas was a bit on the back burner. However, this year she is going to have a party at preschool, another birthday party with friends and then a mini-birthday celebration on Christmas as well as traditional Christmas morning presents. "Make a classic holiday gift with this famous friend! This plush Rudolph is full of cheer and his nose lights up! Personalize your plush Rudolph with clothing and accessories to make the perfect unique gift." Your child can experience such joy when finding a Build-A-Bear Workshop® box under the tree this year or even a small stocking stuffer. It's also neat finding a Bear Buck$® Gift Card to have fun at the store making their own furry friend. One Winner will Receive a $25 Bear Buck$ Gift Card! i will def get the Rainbow Dash for my daughter she is obsessed! My daughters would love the Twilight Sparkle! I would get the Frosty the Snowman for my son. My daughter would like to have Fluttershy. I would love to get the snowman or the Panda, We have the panda for our older son. I would get Merry & Bright Clarice for my niece. I'd love to get the 16 in. Pengy the Penguin for my daughter who loves penguins! I'd get Fluttershy for my son. I would get the 17 in. Wishes Santa for my granddaughter. Pinky Pie for my daughter. I'd get Rudolph for myself! :) I'm a kid at heart! For my daughter I would love to use the gift card to get the 16 in. Pinky the Penguin. So cute!! I'd get the My Little Pony Pinkie Pie or Fluttershy! I like the Snuggly Merry Mouse for my youngest daughter. Thanks for the chance to win! The girls like 16 in. Nick the Sock Monkey and 16 in. Joy the Sock Monkey. I would get the 15 in. Merry Mouse for my niece. I would get Frosty for my son! Thanks so much for the fantastic giveaway! I would get Fluttershy for my daughter! I'd get Clarice for my niece! I would get Rudolph for my daughter! I love his outfit and boots too! Pinky the penguin is so cute! I would love to get the Winter Hello Kitty for my beautiful daughter Madison! I'd get the 16in Panda for my son. All of the Christmas characters are so cute! I like the Christmas mouse, BatMan Bear and the spongebob. I would get Pinky the Penguin for my daughter! I would get the Sunshine Hello Kitty for my granddaughter. Snuggle Up smallfrys® Hot Cocoa Moose for my 15 month old. I would let my son pick but I think he'll choose frosty the snowman. I would get Patrick from Spongebob for my son. I would get the 18 in. Cheerful Monkey for my grandson. I'd get the Glistening Winter White Polar Bear for my friend's daughter. I'd get the dragon for myself. I would be getting Pengy the Penguin. I'm sure my daughter would choose one of the My Little Pony characters! My daughter would love Pinkie Pie My Little Pony. 16 in. Pinky the Penguin for my granddaughter.